What do I need to store? If you can’t specifically answer this question while standing in the container isle, then you’re not ready to buy just yet. Instead, go home and do some decluttering. Let go of items you no longer use, need or love. 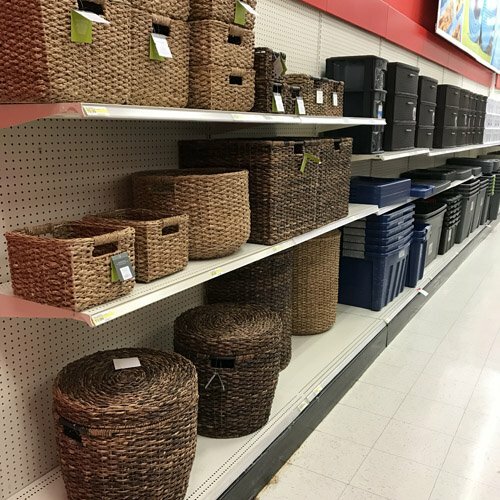 In the process you may find that you empty some perfectly good storage containers for the items you do need to store. Or you may find that you can clearly identify homeless items that truly could benefit from a storage container. Where will I put the container? Once you have identified specific items that need to be stored, next think about where it makes sense to keep them. Do you have similar items already stored somewhere in your home? Perhaps you have some new Holiday decorations that are in need of a home. Is there space for them (and the storage bin you’ve been eyeballing) on a shelf in your basement next to your other holiday decorations? Identifying the primary storage such as the shelf, cabinet, or closet where your items and new container will live is a critical step in creating an organized space. It will help you ensure you buy a container that fits the contents you need to store as well as the location where the container will live. Without asking these questions first, containers can actually add to your clutter instead of helping you be more organized. But with these two questions tucked in your back pocket, containers can be a handy tool in your organizing toolkit. And so many clients want to start with buying a bunch of containers. I often walk into homes full of containers. On the positive side, the tools are often in the house already. Once we do the real work of culling and sorting, we can “shop” the house! So true! I recommend setting up a container station so it’s super easy to shop at home! Nods head in agreement. These 2 basic questions are actually very crucial when it comes to organising, otherwise, we’re just gonna run around in circles. Thank you for sharing! Oh, I agree that fun containers are an incentive – icing on the cake! Just not *the* solution all on their own. But I do love a good container.